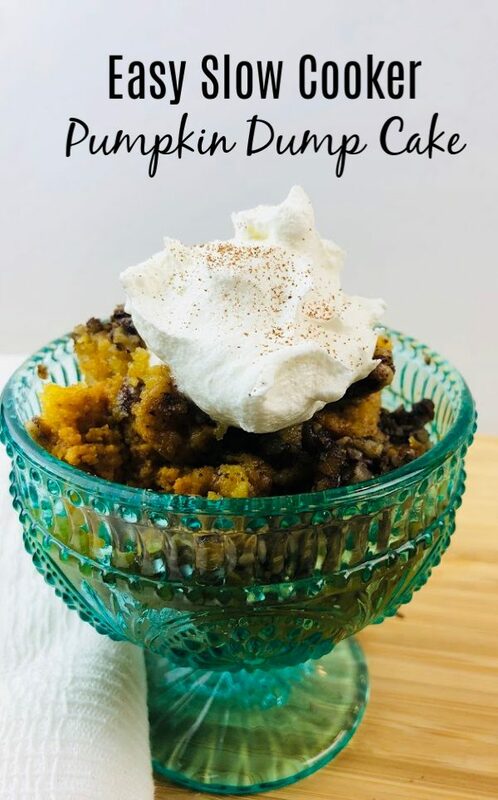 This Pumpkin Dump Cake Recipe Has Many Other Names it Can Go By. Pumpkin Crunch Cake, Pumpkin Pie Cake, Pumpkin Crumb Cake and Pumpkin Crunch Cake are all Names to Describe this Amazing Recipe. 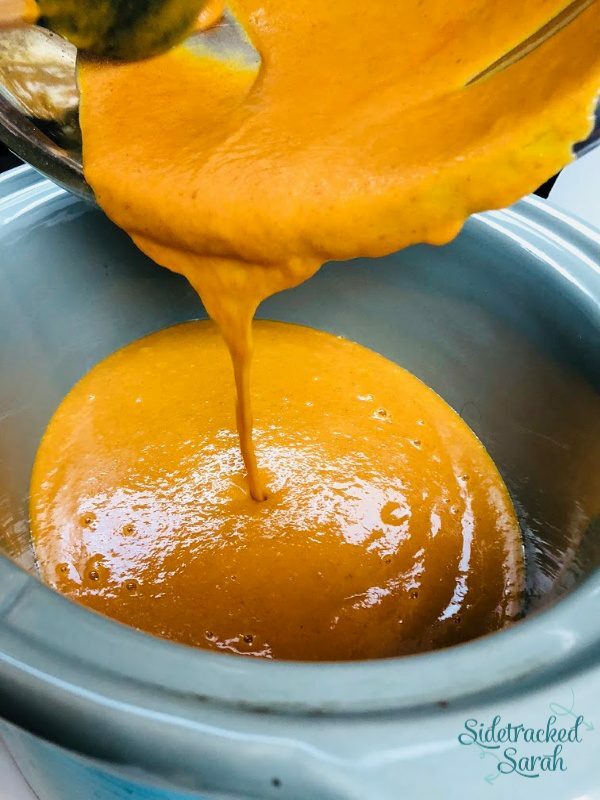 Pumpkin & sweet potato recipes are some of my favorites to make in October, November and December, including Pumpkin Logs & Slow Cooker Sweet Potatoes with Marshmallows. 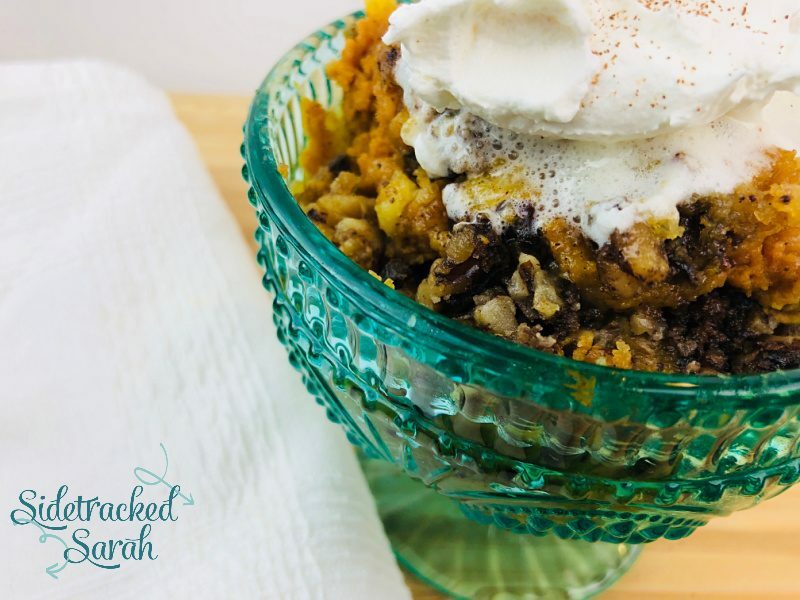 I don’t make a lot of desserts in my slow cooker, but this recipe is one of my favorites. 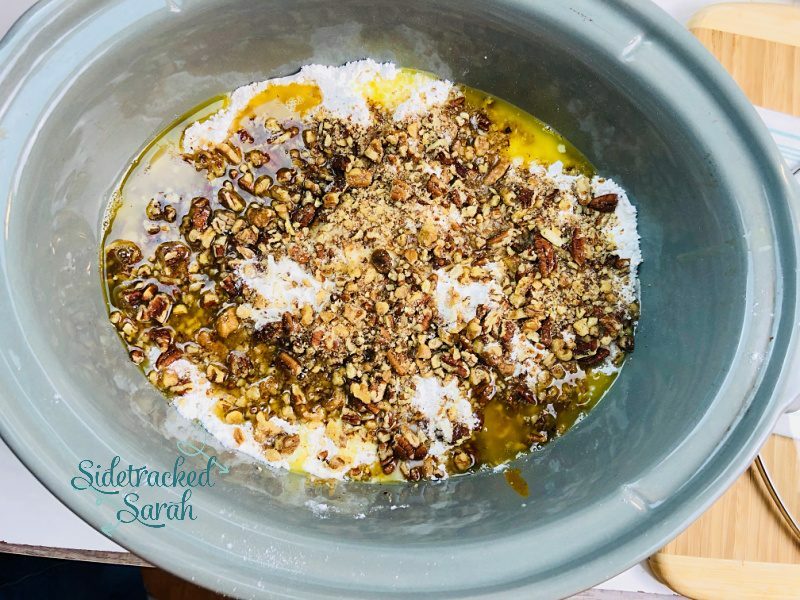 Pumpkin Dump Cake has been a family favorite for years, so this year, I decided it was time to try it out in the slow cooker for a change. I figured it would be the perfect way to cook it on those days when we travel for Thanksgiving or even for a church dinner. Another positive about this recipe, it’s super simple! It seems a bit strange to put together… sprinkling a yellow cake mix over the top, but you’ll see, just how tasty that makes it be! A can of fruit or in this case, pumpkin. They’re usually really simple to put together. They’re delicious. Despite the name, it can’t be a dump cake unless it’s delicious. In fact, you could easily search Ibotta and find out if you can get any cash back on any of the ingredients that the recipe is calling for. Did you know that you can save money on groceries, with a simple little app for your phone called Ibotta? In the app, there will be lots of cash rewards that you can use. Check these 3 out! They would apply specifically to this actual recipe! Plus, there’s tons more offers in the Ibotta app that will give you cash back on things that you are already purchasing on a regular basis! All you have to do is click on the cash reward, letting Ibotta know that you plan to use it and then upload your receipt once you’re done shopping. Then, Ibotta will deposit the cash reward into your Ibotta account that you can later withdraw. They have a cash reward for ANY product that you purchase and even for every time you go to the store to buy bread or milk. Just be sure to upload your receipt when you get home, so those cash rewards will start accumulating. You can get cash rewards from many different grocery stores, including my 2 most used stores, Walmart & Dollar General. There’s a list of nearly 200 grocery stores you can earn cash back on when you shop in person. You can get cash rewards shopping online, too, with over 1,500 options. There are many different items that you will get cash back on that you use regularly. Just check the app before you head to the store to see if anything on your list is on there. I can start earning cash back on my grocery bill right away and it’s simple. Be sure to join Ibotta right away so that you can start earning some amazing cash back bonuses, just for signing up. You can get up to $20 in Welcome Bonuses just for joining. Why Are There 4 Different Names of This Pumpkin Dump Cake? It all depends on your family history and what part of the United States or world you are in. For us, I grew up calling it Pumpkin Pie Cake, but I later learned that the majority of other people call it Pumpkin Dump Cake. I do have a friend who called it Pumpkin Crumb cake. I took me a while to realize that we were all referring to the same cake! Of course, some of the ingredients may be a little bit different, but overall, it’s simple! WANT MORE EASY THANKSGIVING RECIPES? TRY THESE! 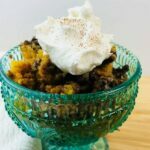 Do I Have To Use a Cake Mix in Pumpkin Dump Cake? 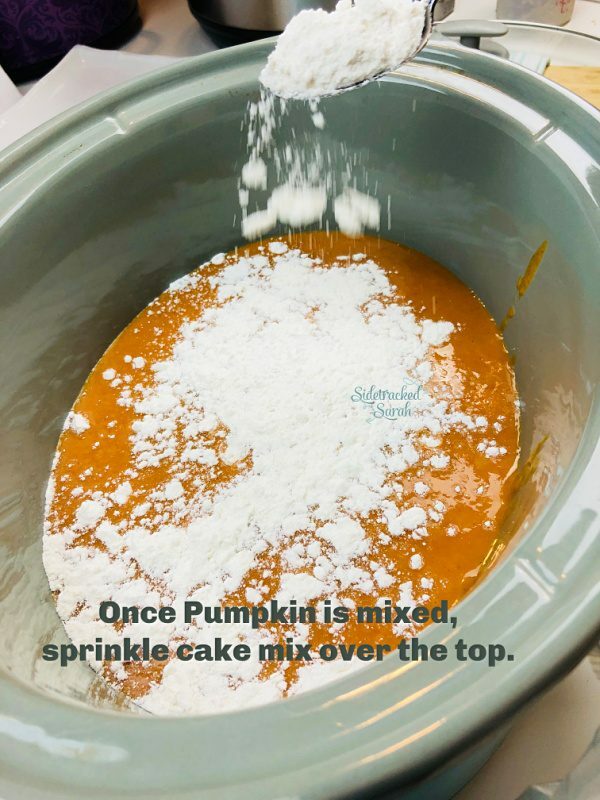 Once it’s all mixed together, you can just use it like you do a regular cake mix, and sprinkle it on the Pumpkin Dump Cake. Can I Leave the Nuts Off of Pumpkin Dump Cake? Sure, that’s not a problem. We have a son who doesn’t like any kind of nut. Sometimes I put them on there anyway, because we LOVE the taste of it with nuts. When I do that, I willingly go and pick all of the nuts off of my 7 year old son’s dessert, lol. It’s just so worth it for me to have the nuts on the cake. But… if you don’t like them, just leave it off. It won’t be a big problem at all! Join Ibotta Today to Save Money on Shopping! Cash back is something you can be thankful for year round! Download the app and start earning today.